With the weather being so nice, where better to photograph an outfit than outside in the sunshine!? 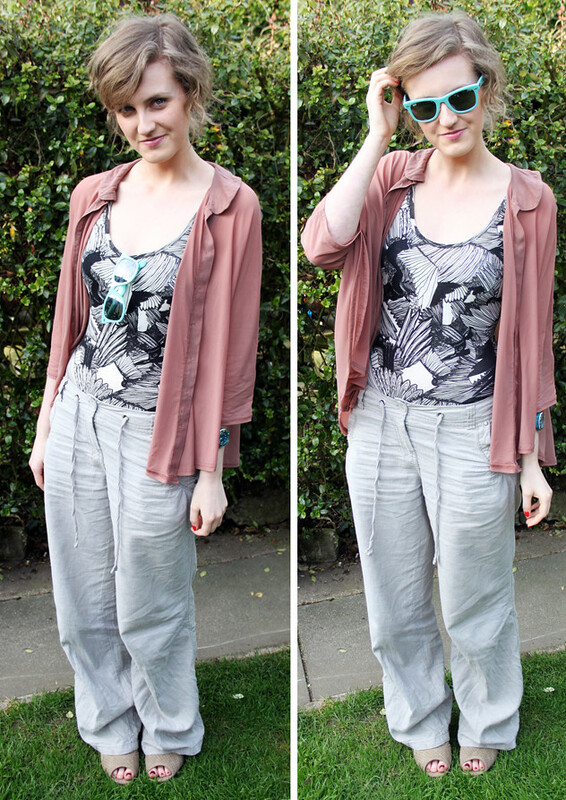 This is what I wore yesterday for a day of running errands, doing work and blogging. We had a cheeky barbecue in the garden for tea, finished off with a scrummy pavalova! I’ve found this weather extremely difficult to dress for, purely because I seem to have got rid of all my Summer clothes, so I’ve been on the hunt for some affordable tops. I’ve orded a couple of nice one from H&M, and picked some up from work and New Look today. Nothing amazing, just simple jersey numbers. The fact that I’m ghostly white doesn’t help either, so I’ll have to dig out the gradual tan! Tomorrow I want to do something nice, just to get out of the house for a few hours. Fingers crossed it stays sunny then we can be outside! What have you been up to in the sun? Three For Thursday – BRITS SPECIAL! "WHERE THE CLOUDS ARE FAR"
Looking lovely. Those Ray Bans are supper cute.